Apparently some website called The Root (the root of what I wonder) has delusions about being the arbiter of blackness or something. The folks at the website have put up a list of people they wish they could remove from black history because they are "embarrassing". Okay whatever. Now some folk are trying to say that it was just a joke, tongue in cheek silliness. Yeah it's silly alright. Too late to try putting that toothpaste back in the tube now people. You've already put the foolishness out there. I'm not going to link to the list but I will link to two posts discussing it. First at Booker Rising, TheRoot.com Releases "Black Folks We’d Like To Remove From Black History" List: Bookerista Response and second Althouse, Black Folks We'd Like To Remove From Black History. I found the contrasting tones of the comments on the two posts very interesting. In any case, this stunt doesn't make me very interested in visiting The Root any time soon. Hubby is home for the snow day. This thankful list swiped from a facebook friend, "Bathtubs filled with hot water. Good teachers. The military...and steak." Friends who remind me what things are really important. People do listen when you keep trying to portray them as racists. They're just not coming to the conclusions that you want them to about your claims. The bible says that there is nothing new under the sun. Now ain't that the truth. Virginia lawmaker Bob Marshall seems to be channeling Jesus' disciples from a couple thousand years ago and not in a good way. "The number of children who are born subsequent to a first abortion with handicaps has increased dramatically. Why? Because when you abort the first born of any, nature takes its vengeance on the subsequent children." "In the Old Testament, the first born of every being, animal and man, was dedicated to the Lord. There's a special punishment Christians would suggest." 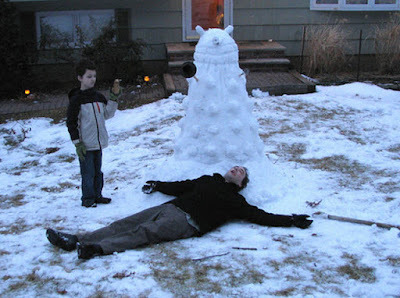 For those of you who have more snow than you know what to do with here's an idea. Those Daleks have got more lives than a Time Lord's cat. As one commenter at the site says, "PRECIPITATE! PRECIPITATE!" I dislike appeals to scientific consensus preferring to peruse the research that current scientific opinion is based on for myself. Having said that, in light of Lancet finally getting around to retracting Andrew Wakefield's 1998 study that claimed that vaccines were linked to autism, Popular Mechanics is taking a look at some studies that have claimed a link between vaccines and autism. Now that the infamous 1998 Lancet study implicating vaccines for causing autism has been retracted, does the anti-vaccination movement have any scientific legs left to stand on? Here, we investigate the scientific merit of some of the other lightning-rod studies from over the last decade that anti-vaccination advocates say back up their claims. Little voices gleefully shouting, "Daddy! Daddy!" and "Mommy! Mommy!" That yellow blob in the sky. I'm pretty sure it's the sun. Modern medicine. We'd be so miserable without it. The news has hit the main stream media that part of the proposed revisions destined to be in the next edition of the Diagnostic and Statistical Manual (DSM) include incorporating the current category of Aspeger's Syndrome, along with Pervasive Developmental Disorder (PDD), Pervasive Developmental Disorder Not Otherwise Specified (PDD-NOS) and a few others, into the larger Autism Spectrum Disorder category. All in all I think this is a good move that will result in more accurate diagnosis and better access to services for individuals who currently have autism related diagnoses but not the label autism. You know, "Escape the draconian rule of the green police by buying our cool green car" doesn't really strike me as good pr for environmentalists or the car. Americans have a bit of a history of starting revolts over stuff like this. Planned Parenthood, NOW, et al got played tonight. Had they not made such a fuss about the Tebow Super Bowl ad I doubt anyone would have noticed it. Instead they made a big stink and got everyone talking and watching. Tebow's story was all over the internet, television and newspapers long before the ad aired tonight. Focus on the Family got far more than they paid for thanks to the hyperventilation of those groups who felt that Focus on the Family shouldn't have been allowed to share their message during the super bowl (hello freedom of speech anyone?). Can't have women on television talking about how much they love their kids now can we? How is it that this is so objectionable but there's not a peep about other ads that I won't mention? Those are some interesting priorities. This is the other ad that aired during the pregame festivities.